Did you know that Sarkozy is the only French leader that visited Rwanda after the 1994 Genocide against the Tutsi? Nicolas Sarkozy served as French president from 2007 to 2012. During his visit to Rwanda as French president in February 2010, Sarkozy admitted his country’s “serious error of judgment” about the situation that prevailed in Rwanda in the lead up and during the Genocide which claimed the lives of more than a million people. Following the end of the Genocide, which was stopped by the Rwanda Patriotic Army that was then under the leadership of President Kagame, Rwanda and France have mostly been at odds and evidence has been piling up about the latter’s culpability, further ramping up the pressure on Paris to admit its role in the Genocide and help bring to justice Genocide fugitives on its soil. 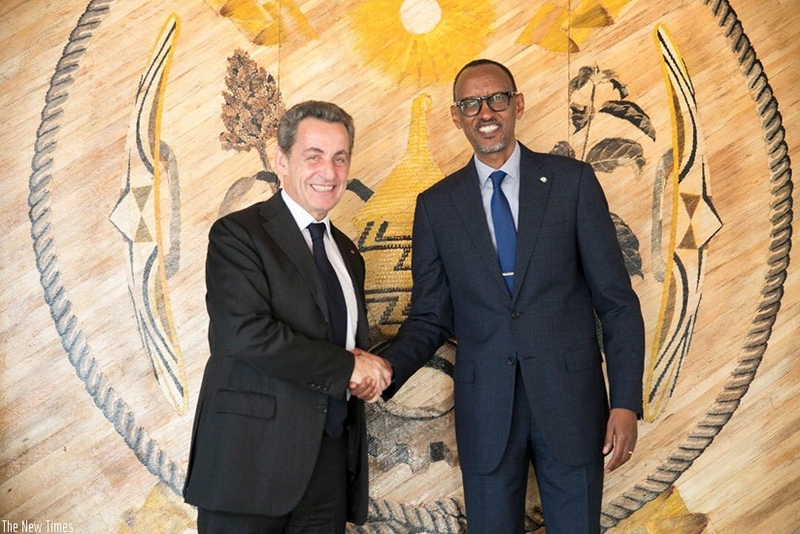 Now many Africans are wondering why Sarkozy is getting too close to Presidnet Kagame? Actually, the former French president Nicholas Sarkozy arrived Rwanda on January 15, with a group of French investors to explore investment opportunities in the country. The business mission is composed of investors from French multinational firm Bolloré, and they include executive Cyrille Bolloré. Sarkozy began the two day visit with a courtesy call to President Paul Kagame at Village Urugwiro in Kigali. This was followed by a closed-door meeting with senior officials from the Rwanda Development Board (RDB), led by chief executive Clare Akamanzi, with a view to identify potential areas of investment, according to Rwanda’s New Times. Bolloré Logistics is a world renowned transport and logistics firm with a presence in multiple countries, including Rwanda. From the reactions Gina Informs gathered from Africans on social media, quite a handful are pessimistic about the visit, because of the tensed relationship Kigali has had with Paris over the years, even though others see it as the beginning of something good.